Now, we know that no self-respecting gourmand would even think about using a microwave, and certainly not for making popcorn, but we can't all be saints. Sometimes, you just don't have the time, or you only want a small serving. Maybe you don't eat popcorn all that often, and so don't see the point of buying a popcorn maker. And, after all, who said gourmet had to mean labor-intensive? There are plenty of fresh popping corn kernels that can be used in a microwave, such as the Amish County range, and there are plenty of microwave safe popcorn makers, specially designed bowls that ensure an even heat, and keep your popcorn from flying to all four corners of your microwave. And, just like popcorn made in a counter top popper or on the stove, you can still add quality flavors and seasonings to your microwave popcorn. But Isn't Microwave Popcorn Bad For You? While regularly microwaving food probably isn't the most sensible way to cook, there are very few risks associated with simply enjoying the occasional bag of microwave popcorn. The main cause for concern with store-brought bags of microwave popcorn is a chemical call diacetyl. However, it is important to note that diacetyl is a naturally-occurring chemical, and harmless if ingested. The risk factor comes into play when diacetyl is inhaled, for example, by someone taking long, deep sniffs of bagged microwave popcorn, or working in a factory that produces bagged microwave popcorn. Diacetyl is used in bagged microwave popcorn as a flavor enhancer, and creates the much-loved buttery taste. Diacetyl is used in many everyday items – including vaping equipment. To be affected by the quantities in a bag of microwave popcorn, you would have to be eating several bags of microwave popcorn per day, and inhaling the scent from them. Most big-name popcorn kernel brands have stopped using diacetyl in their products, just to be safe. However, you can easily avoid diacetyl, and other chemicals, by investing in a microwave popcorn maker, and using microwave-suitable, fresh popping corn kernels. 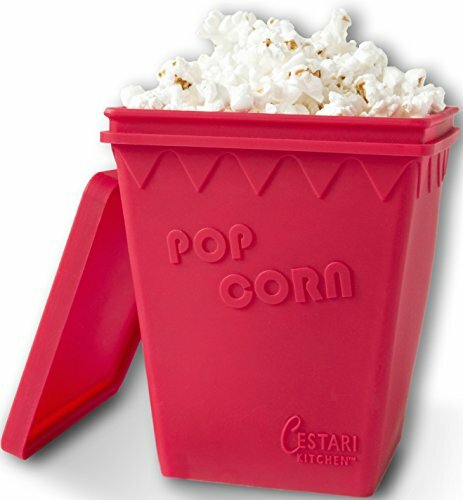 The Cestari Kitchen Microwave Popcorn Maker is dishwasher safe, and made from durable, high-quality, hypoallergenic silicone. It doesn't need oil, so is easy to clean, and ensures your snacks stay healthy. The Cestari is the perfect size for college dorm rooms, or that tiny first apartment, and would go down well in a student care package – along with some suitable gourmet popping corn kernels and seasonings, obviously! It does, however, become very hot during use, and therefore caution is advised, particularly if children are present in the kitchen. As with all microwave containers, ensure you use a dish towel or oven gloves to remove it from the microwave. 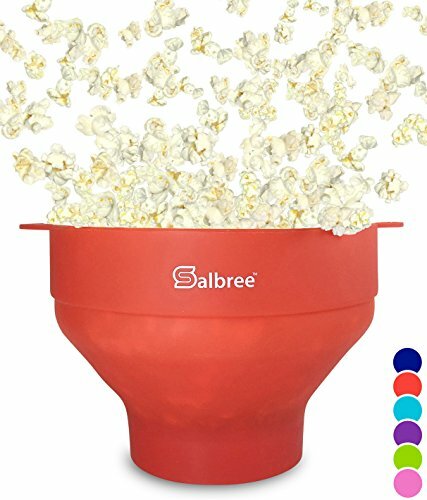 The Salbree Microwave Popcorn Maker comes in a range of fun, bright colors, to match any personality or kitchen scheme. It is dishwasher safe, and features built in handles for increased safety. While the Salbree states that it doesn't need oil, many people have observed that, without a small amount of oil, there are quite a few burned kernels. Therefore, it may be sensible to just lightly grease the Salbree with oil before use. 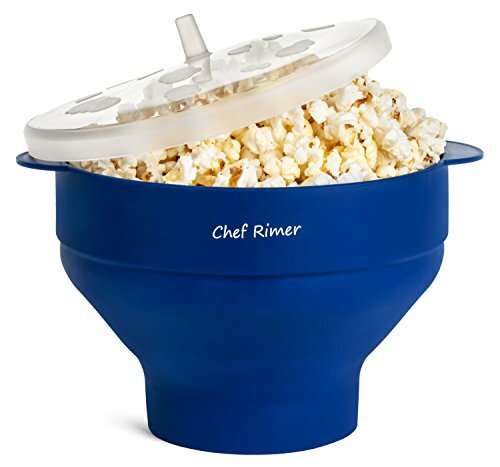 Finally, the Chef Rimer Microwave Popcorn Maker collapses down for easy storage when not in use – throw it in a drawer, or pack it in your suitcase to take on vacation. Manufactured to ensure even heat spread, and with convenient handles, the Chef Rimer comes in a range of colors to suit any style. Its large size makes it ideal for providing enough popcorn to share. Some people have commented that the handles still become very hot during use, so, as always, caution is advised – try and restrain yourself from snatching that delicious popcorn the minute the microwave pings to say it's done! If you absolutely must have bagged, microwaveable popcorn, then we've reviewed the three best brands, so you can make the right choice, and enjoy a guilty pleasure. 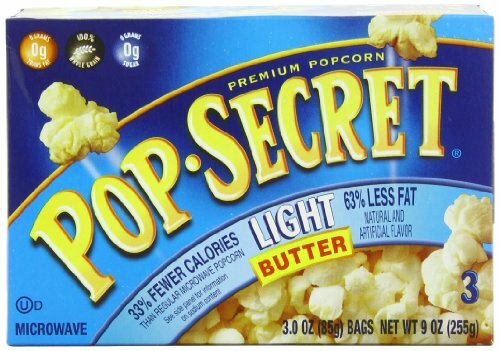 Pop Secret Popcorn probably isn't as secret as the name claims, being one of the top sellers in the country. Certified kosher, Pop Secret comes in a range of 12 flavors, and offers six individual bags per pack, so you can easily treat your whole family – once you've all agreed on a flavor, of course! 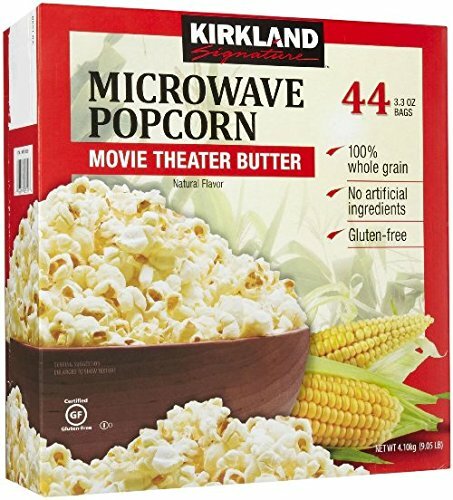 Kirkland Signature Popcorn has a crisp, fresh taste, and is 100% whole grain, with no artificial ingredients. Kirkland Signature does, however, use palm oil, which may present ethical issues for some consumers. Palm oil production has been linked to deforestation and loss of habitat, as well as the displacement of indigenous peoples in Malaysia and Indonesia. Quite apart from the ethical considerations, palm oil doesn't impart a particularly strong flavor, leaving the popcorn merely greasy. The microwave bags also have a tendency to split open during heating, resulting in oil getting all over the microwave. Finally, Act II Butter Lovers Microwave Popcorn has a good buttery taste, although some of our testers said they still had to add real butter once the popcorn was done, as the popcorn comes out a little dry. Act II microwave popcorn does pop very quickly, so is the ideal snack to keep around the house for those times when you just can't wait! Whether you use a microwave, a hot-air popper, or the good, old-fashioned pan on the stove for your popcorn, whether you cook in olive oil or coconut oil, and whether you prefer caramel or cinnamon on the end product, the opportunities truly are endless. What started out as a simple snack can quickly become a genuine gourmet obsession, and one which will also teach you a little about agriculture in various areas, too. It is, after all, the soil conditions and growing methods, as much as the corn variety, which produces the subtly different tastes of various popcorns. So, pick your method of popcorn making, get some kernels on the go, put your favourite move on – and sit back and enjoy! As a final advisory note, while yes, indeed, puffed rice is certainly a thing, please don't try and use your popcorn maker for making puffed rice. This is a separate process, requiring specific equipment. Newer PostWhat's the Best Gourmet Unpopped Popcorn?